Should I Buy an Engagement Ring With My Credit Card? Congratulations on your impending nuptials! You may be wondering if you should buy your engagement ring with your credit card. There are pros and cons to buying an engagement ring with your credit card, and much of it depends on whether you can afford to pay the credit card off right away. Rewards — This is always the big enticement when it comes to big purchases. Engagement rings may cost several thousand dollars, so the ability to rack up several thousand rewards points or miles in one fell swoop is very alluring. It can be especially helpful if you are planning to cash in miles or points for your honeymoon. Dispute recourse — If for some reason, you get into a dispute with the engagement ring seller, you’ll be able to dispute or challenge the credit card charge. It is very rare for a reputable diamond merchant or jeweler to swap cubic zirconia for a diamond, or to swap one diamond out for another. 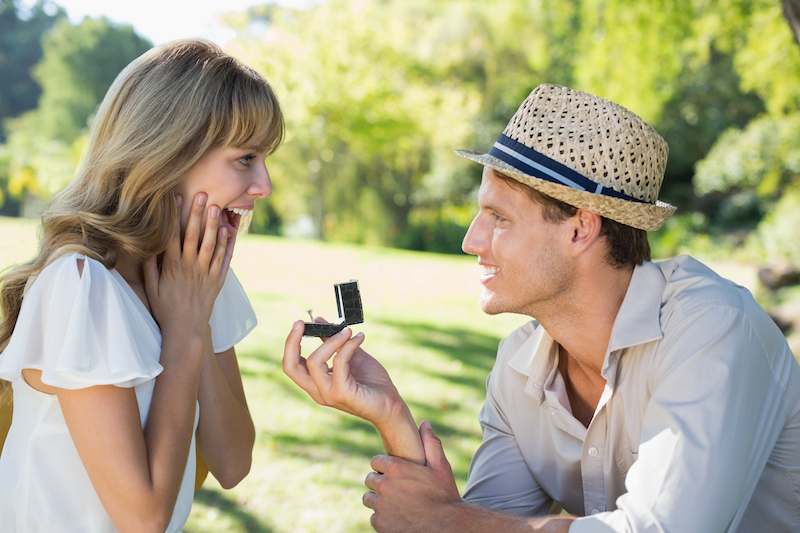 However, if you have made a poor choice for your engagement ring provider, you’ll be happy to have this recourse. Possible additional protection — Many credit cards offer theft protection or some other kind of liability coverage to supplement any insurance you may have, in case your ring gets stolen. This additional insurance may come in handy if you are so unfortunate. However, read the fine print in your credit card guide to benefits, because jewelry is often either exempt from such protection or the reimbursement is limited. There are also usually requirements, such as filing a police report. Credit score — If you don’t happen to have a lot of available credit on all your credit cards, making a massive purchase like this could increase your credit utilization. Utilization is basically how much of your credit limit you’re using, and it plays a big role in your credit score. Having more than 30% of the limit on any card in use negatively it affects your credit score. If you plan to pay off the card right away, it’s no big deal. You’re in debt — If you can afford to pay off the purchase in full when you get your statement, then this doesn’t affect you. However, if you are planning to carry this balance for a few months, you need to be careful about falling into a debt situation you cannot handle. Ideally, if you are getting that ring, you’ve put it on a 0% introductory rate card or another low interest rate card. If you aren’t doing that, then remember you will be paying off that ring at what may be a high interest rate. This will actually be the first test case for how you and your future spouse will handle financial decisions. You should actually discuss the purchase of the ring with her. I know, you want to surprise her. But this will give you an indication if your future spouse is responsible. Budget the purchase as you would any other. If she loves you, it really won’t matter what you spend on the ring.